Munnar is Replete With Tea Plantations, Spice Plantations, Gorgeous Waterfalls And Shimmering Lakes. Munnar has been experiencing incessant frost for more than a week now; and it has never looked this gorgeous. Perched at an elevation of 1600 m above sea level, Munnar is best known for producing India’s finest tea and spices. The enchanting, rolling hills of Munnar offer refuge to those seeking complete rejuvenation – in lush and peaceful surrounds. 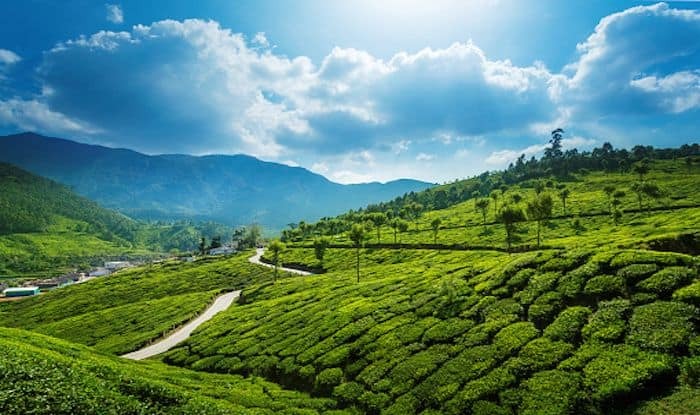 Munnar used to be a retreat for the British when they ruled in South India; and today has a legacy of its own and attracts lakhs of people from across the globe. Start your travel in Munnar by visiting the Tea Museum. You can learn about the genesis and growth of tea here and look at the photographs, machinery and various other things which speak about the history and origin of tea plantation in Munnar. The quaint hill station is best explored on a cycle; it’ll be an experience to explore the manicured tea plantation, pass gushing waterfalls, enjoy shimmering lakes and spot an elusive animal called the Nilgiri Tahr at the Eravikulam National Park of Munnar. For another gratifying experience, go for a pleasurable boat ride to Mattupetty dam which is also famous for its dairy farm. Here you can see a variety of high-yielding cows as well. Munnar plays a key role in growing some of the most important spices like cardamom, cinnamon, nutmeg, ginger, and turmeric. Among the waterfalls here, remember to especially check these out: Attukal, Cheeyappara, and Valera. They are some of Kerala’s mightiest and most beautiful waterfalls. Munnar is an idyllic escape into the wonders of God’s own country, Kerala. It is a lowland hill station where the scenery is magnificent and its drowsy little bungalows lends it an old world colonial charm. A leisurely walk in the evenings with a loved one at Hydel park is one of those experiences that stay with you for a long time. Munnar is about the little things, and cherishing each one of them in all their glory. The nearest railway stations from Munnar are in Aluva, about 108km away and Angamali, about 109km away. The nearest airport is theCochin International Airport, via Aluva – Munnar Rd, about 108km away.